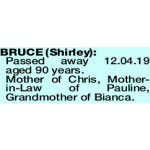 Passed away 12th April aged 90. Mother of Michael, nan of Kim, friend of Rita. Always loved, always remembered. 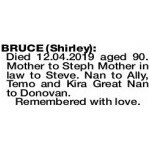 The Funeral Cortege for the Late Mrs Shirley Fay Bruce of Nedlands, formerly of Bayswater will assemble at the Main Entrance of KARRAKATTA Cemetery for a Cremation Service at 11am on THURSDAY (18.04.2019). BRUCE SHIRLEY Died 12.04.2019 aged 90. Mother to Steph Mother in law to Steve. Nan to Ally, Temo and Kira Great Nan to Donovan. 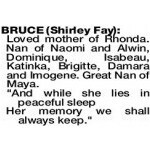 BRUCE SHIRLEY FAY Loved mother of Rhonda. Nan of Naomi and Alwin, Dominique, Isabeau, Katinka, Brigitte, Damara and Imogene. Great Nan of Maya. Her memory we shall always keep." BRUCE SHIRLEY Passed away 12.04.19 aged 90 years. 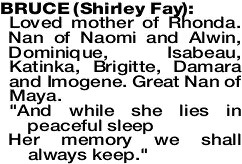 Mother of Chris, Mother- in-Law of Pauline, Grandmother of Bianca.